Front pocket is big enough for towels and some essentials. Bottom space - for wallet, keys and etc . Back Space to put a bladder. dry in rain. Bladder system can be removed and cleaned. keep you cool and dry in the heat. so the bag is a good source of hydration for youth. Hydration pack with a tube spout holds full insulated tank. Perfect gear when run, travel or ski. Fill bladder with water or add ice cubes. from bladder through the valve. Put the bladder into the backpack. and restricts water to slosh. 100% Refund Policy! 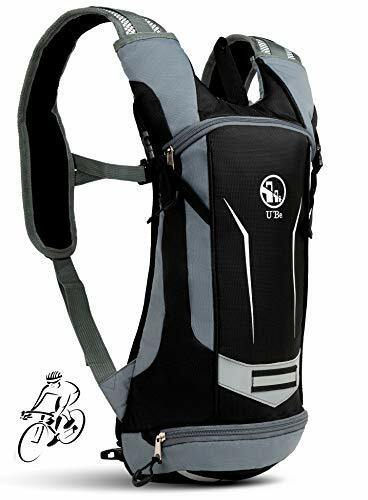 Ultralight and slim backpack 2liter hydratation system for youth and adults, envisages prompt replacement of camelback or full refund upon request! If you have any questions about this product by U`Be, contact us by completing and submitting the form below. If you are looking for a specif part number, please include it with your message.